Each student begins with 20 fish out of water. Each player rolls a die and counts out that many fish to return to the fish bowl. The first player to return all 20 of his/her fish to the bowl wins the game. You may use foam fish cutouts and a plastic bowl for a more realistic version of the game or download the directions, game mat and center icons for Fish Out of Water. 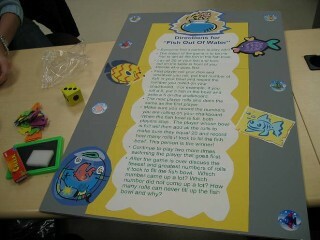 This game was developed by Christine Sweeney, a Monmouth University student, for the ED 556 Probability Fair. Download the directions, game mat and center icons for Fish out of Water. Play Count Us In: online games designed to help children understand basic number concepts. Download Car Race: students toss a die and move cars that many spaces. First player to cross the finish line wins the game. Download the directions, game mat and center icons for Car Race. This game was developed by a Monmouth University student for the Probability Fair. Download Fish out of Water: Each student begins with 20 fish out of water. Each player rolls a die and counts out that many fish to return to the fish bowl. The first player to return all 20 of his/her fish to the bowl wins the game. You may use foam fish cutouts and a plastic bowl for a more realistic version of the game or download the directions, game mat and center icons for Fish Out of Water. This game was developed by Christine Sweeney, a Monmouth University student, for the ED 556 Probability Fair. Download Dino Blast Game: students toss the die to see whether the odd or even player will get to move forward one space. First player to reach the last circle on the path wins. 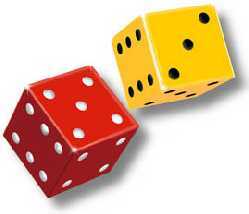 This game can also be played with 2 dice and students check the sum to see if it is even or odd and move pieces accordingly. This game was developed by a Monmouth University student for the Probability Fair.